Dallas photographer, Maryna Matorina, captured this fantastic Fenom action shot at IBJJF Austin Open and we absolutely love it. It represents jiu-jitsu at its finest: staying calm and collected while applying a submission in a nerve-wrecking situation. Tournaments are some of the most stressful events for kids and adults alike: butterflies in stomach, adrenaline pumping, teammates and instructor watching, opponent’s team yelling. At times it feels like a total blur; time is frozen and there seems to be serious miscommunication between the brain and the body. The brain goes blank and your game plan that you drilled for months has left the building. Even though it is a popular belief that there is no losing in BJJ, only learning, it feels great to submit your opponent while serene and rocking a gorgeous gi. Congratulations! Our newest women’s gi jacket is made of premium, pre-shrunk, brushed pearl weave fabric. Pants are made of pre-shrunk, super soft cotton drill fabric. 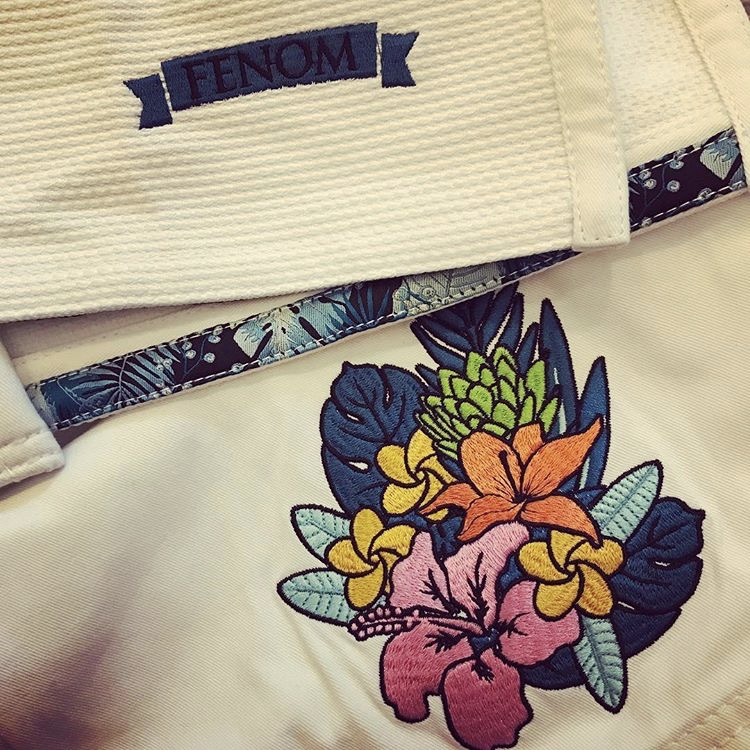 The gi has oversized, immaculate tropical flowers embroidery on the pants, trademark F, and smaller tropical flowers accent on sleeves. If you are in between sizes, we recommend to go with a smaller size; it is not a shrink to fit gi. The gi retails at a very affordable 115.00 dollars, and as always, mix and match in regular, tall, and curvy sizes are available. Enjoy the endless summer vibes, and happy shopping!